Dr Li Li is currently an Advance Queensland Research Fellow (Mid) at Australian Institute for Bioengineering and Nanotechnology. She received her PhD in Chemical Engineering from China University of Petroleum. 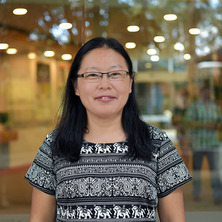 In 2007, she joined the University of Queensland (UQ) as a postdoctoral research fellow in the ARC Centre of Excellence for Functional Nanomaterials, working on nanoparticles and nanomaterials for renewable energy production and storage, environment technology and catalysis including hydrogen production and storage, environmental protection, and gas adsorption. In 2011, she was awarded UQ Postdoctoral Fellowship under the supervision of A/Prof. Zhi Ping (Gordon) Xu, working on engineered nanomaterials in healthcare and environment control. After Postdoctoral Fellowship, she was awarded Advance Queensland Research Fellow in 2016. Her research focuses on design and engineering functional nanomaterials for drug/gene delivery, sustainable release and oral vaccine delivery for human health and animal health management. Since 2011, she has attracted several research funding including Advance Queensland Fellowship (Mid), Queensland smart future fund, UQ Postdoctoral Research Fellowship, 3 UQ grants and 2 international collaboration projects. Moreover, she has a strong linkage with industry partners on the development of functional targeted nano-delivery systems to enhance the health of farm animals. Development of cost-effective nanoplatforms such as solid lipid nanoparticles and hierarchical nanoparticles to efficiently deliver antigens to enhance immune response. Develop a cost-effective oral delivery platform for anti-bacterial plant extracts and antigens combined with animal feeds to control the bacterial infections in poultry. Porous materials such as ordered mesoporous silicas and carbon materials for energy production and storage. Li, L and Yan, ZF (2005) Review of catalytic dehydrogenation of isobutene. Progress in Chemistry, 17 4: 651-659. Li, L and Yan, ZF (2005) Synthesis and characterization of intercalated mesostructured PANI/V2O5. Nanoporous Materials IV, 156 523-528. Zhang, X.Y., Zhu, H.W., Li, L., Li, G.Z. and Wang, Z.W. (2003) The progress of QSAR/QSPR for surfactants. Progress in Chemistry, 15 5: 351-360. Wang, Z.W., Li, G.Z., Zhang, X.Y. and Li, L. (2002) Prediction on critical micelle concentration of anionic surfactants in aqueous solution: quantitative structure-property relationship approach. Acta Chimica Sinica, 60 9: 1548-1552. Li, L., Zhang, X.Y. and Yan, Z.F. (2004). Quantitative structure-property relationship study for the prediction of cloud point of nonionic surfactants. In: 227th National Meeting of the American-Chemical Society, Anaheim, CA, United States, (U827-U827). 28 March - 1 April 2004.